The issue between Narayan Murthy, Co-founder & Vishal Sikka, the then CEO of Infosys has been in the boil since the beginning of this year. In February Murthy (net worth: $1.5 billion), in an interview criticized the administration for paying high severance packages to some executives. Murthy, alleged that such actions raise doubts about possible discrepancies in the company. Though Sikka tried to downplay the incident then and urged the employees to not pay attention to such media reports in an internal letter to his employees. 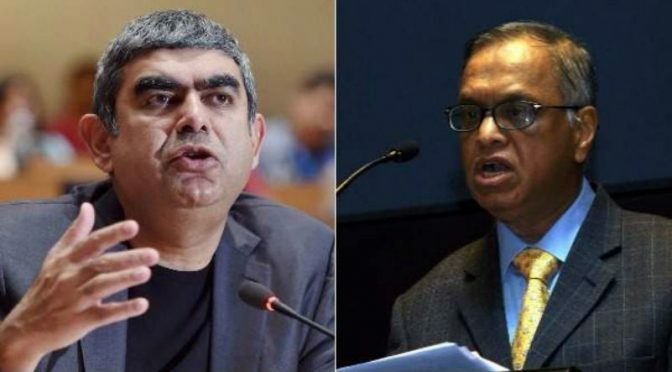 In the downwind of this spat, the board members and executives of Infosys were forced to choose sides, while the old timers of Infosys including Mohandas Pai supporting Murthy. And others like Oppenheimer funds & Kiran Mazumdur Shaw backed Sikka. Just when things looked to have settled down, Murthy in early august demanded the administration to disclose the findings of an internal investigation report carried out in Infosys over alleged irregularities in acquisition of two US based firms Panaya & Scava, which the administration refused. These allegations and the following criticism was the tipping point in the board vs founder spat. This resulted in the resignation of the CEO Vishal Sikka and proxy takeover by the founding members through the re-entry of Nandhan Nilekani in the board. Similar set of events unfurled even in the days leading to the ouster of Cyrus Mistry from Tata groups. The feud between Mistry and Tata grew because of Mistry’s criticism over the continued production of Tata Nano cars to which Tata had a personal attachment to. While Sikka voluntarily resigned, Mistry was forcefully removed, at the end of the day the emperor gets what he wants. Business magazines are littered with such feuds between the founders and the board. Narayan Murthy, who has time and again lectured others about meritocracy and talent, has proved himself to be a complete hypocrite. This is shown by his reluctance to give up control over his company and also indirect promotion of family members (as in 2013 allowing back-door entry of his son) or promotion of his own cronies like Nandhan Nilekani. These corporate executives are the same ones who argued for the liberalisation of the economy and the free trade agreements, and rode the upswing of the economic wave to the top. When the free trade agreements were proposed, these capitalists happily jumped on board and promised us that it would bring us more opportunities and employment but chose not to tell us that it would also make them extremely rich by exploiting the cheap labor available in this country. After all these years, they still kept underpaying the workers and kept them in check by the threat of unemployment. Any claims for increased wages is met with threat of losing business to other Asian countries like China or Indonesia. The struggle for the economic pie has grown across borders now and by the day more number of people are realizing that the threat to the Indian worker is not a Chinese worker or a Pakistani worker but the multinational crony capitalists that exploit them all. The Indian corporate elites, who on one hand praised the benefits of liberalization and free trade to the mass population, sing a different tune when it comes to the question of their own succession. These Monarch CEO’s are so power drunk that at times they refuse to step down even when faced with solid reasons to do so. They strive to keep the control among themselves and make sure that their status quo remains unchallenged even at the cost of their company. In the following days after Sikka’s exit, the stock prices plummeted over 13%, eroding close to 24000 crore rupees in Infosys’s market valuation. Business magazines called it ‘the Sikka effect’. This is exactly the reason why it is important for the working class populace to be aware about the two facedness of these power hungry capitalists who always strive to be in control, at times even at the cost of their company growth or fate of employees. Reports emerging suggest that companies in talks for future projects are now holding back sighting internal instabilities in the Infosys administration, and eventual business losses. 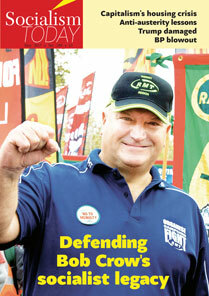 When such losses occur the workers are the first ones to face the axe under the pretext of cost optimization. Our immediate history is filled with such instances like Kingfisher, Satyam, etc. At a time when the service sector based economic model of this country is beginning to look fragile in the face of global economic slowdown, the spat at top within Infosys is also a reflection of this. In the absence of labor laws and unions protecting the interest of the workers in this sector seen by threats of mass layoffs, board members will always get away with huge exit packages despite all the infighting. As socialists, we do not take sides with respect to corporate boardroom infightings, because at the end of the day no matter who triumphs, the ordinary workers will always bare the brunt of exploitation and low pay. But what we would like to point out is the undemocratic nature of corporations that completely rules out workers’ say with respect to what to produce, how to produce and what to do with the profits. As long as workplaces continue to be private entities, controlled and manipulated by a clique at the top, all boardroom changes shall remain cosmetic.